This is the all-new Vivaro van, Vauxhall's rival to the Ford Transit Custom and Volkswagen Transporter. On sale February 2019, the medium size van will reach showrooms in the summer with prices starting in the region of £21,000 before VAT. 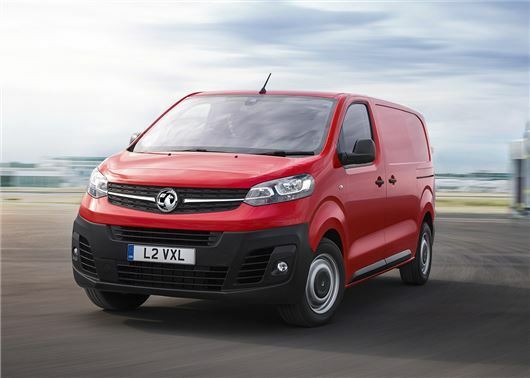 The 2019 Vivaro will play a fundamental role in reviving Vauxhall's fortunes, under its new PSA ownership. It'll be built exclusively in Luton and be diesel-only until 2020, when an all-electric version will be added to the range. The Vivaro is based on a new platform, shared with the Citroen Dispatch and Peugeot Expert, which allows it to carry a maximum payload of 1.4 tonnes. However, while the 2019 Vivaro will carry 200kg more than the old van, the maximum load area has been cut from 8.6 to 6.6 cubic metres. Available in two lengths (4.9 and 5.3 metres) the Vivaro will carry objects up to 4.0 metres in length and 1.4 metres high. It can also be fitted with electronically operated side doors, which can be opened hands-free thanks to an optional sensor in the side of the van that's activated with the kicking motion of a foot. Maximum braked towing weights peak at an impressive 2.5 tonnes. Being smaller than the outgoing Vivaro, the 2019 van should be cheaper to run. It shares the Dispatch and Expert's efficient range of 1.6 and 2.0 turbodiesel engines and advertised fuel economy for all versions will exceed 50mpg. Its Euro6 emission status makes it exempt from urban pollution charging zones. Away from the city buyers can spec up the van to cope with wintery road conditions, thanks to an all-road pack that increases ground clearance and adds underbody protection. IntelliGrip smart traction control will allow the driver to cope with mud, sand or snow, with the turn of a dashboard mounted dial. Inside, Vauxhall is promising car-like levels of comfort and driver assistance with electronic adjustments for the seats, adaptive cruise control, touchscreen navigation, head-up display and automatic emergency braking that will avoid or reduce the impact of an accident. It isn't clear what the Vivaro will get as standard, but the options list will include a raft of smart tech, including a virtual rear-view camera image that can be displayed either on the interior mirror or on the seven-inch infotainment display. The van will also prompt the driver to take a break ﻿after two hours of non-stop driving, or by monitoring the driving behaviour. The all-new Vauxhall Vivaro will make its world premiere at the NEC CV Show in Birmingham on 30 April 2019.